TV Bulletin Board (Thurs., Nov. 20) -- Netflix rides to the rescue of Longmire, etc. 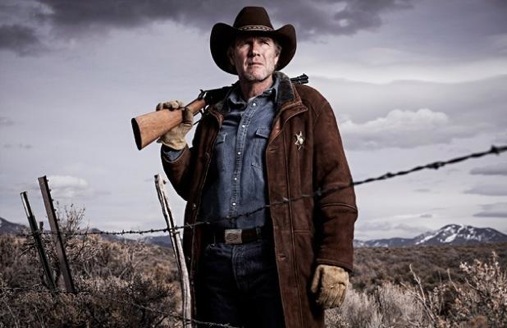 Netflix’s latest rescue mission is Longmire, which was canceled by A&E after three seasons. It’s slated to return sometime in 2015 with 10 new episodes, the streaming network announces. Netflix previously gave AMC’s The Killing a stay of execution and reunited the cast of Fox’s Arrested Development for a final go-around. *** AMC has announced a two-night premiere for Better Call Saul, the Breaking Bad prequel starring Bob Odenkirk. It will launch on Sunday, Feb. 8th, with a second episode to follow on Monday, Feb. 9th. The series’ regular night and time will then be Mondays at 9 p.m. (central). The series is set six years before shyster attorney Saul Goodman met Walter White. He was known as Jimmy McGill back then. Here’s the new trailer, but you’ll have to endure a commercial first. ***The broadcast networks’ cancellation corral now officially houses five deceased new fall series plus a returnee from last season with CBS’ axing of The Millers. Also dumped: ABC’s Manhattan Love Story and Selfie; NBC’s A to Z and Bad Judge and Fox’s Utopia. ***CNN has announced a sequel to The Sixties. It’s The Seventies from the same executive producers, Tom Hanks and Gary Goetzman. The eight-part docu-series is due in the summer of 2015. ***Comedy Central has retitled its successor to The Colbert Report and also announced a premiere date. The Nightly Show with Larry Wilmore, previously titled The Minority Report, will debut on Monday, Jan. 19th at 10:30 p.m. (central). Wilmore also has been a force behind the camera as a co-executive producer of series such as The Bernie Mac Show and the current ABC first-year hit, black-ish. Before taking over for David Letterman (on a still undisclosed date), Stephen Colbert will be hosting CBS’ annual telecast of The Kennedy Center Honors on Tuesday, Dec. 30th. Recipients this year are Tom Hanks, Al Green, Lily Tomlin, Sting and ballerina Patricia McBride. ***Turner Classic Movies will remember late, great director/producer Mike Nichols with a triple feature of his films on Saturday Dec. 6th. Who’s Afraid of Virginia Woolf? airs at 7 p.m. (central), followed by The Graduate (9:30 p.m.) and Carnal Knowledge (11:30 p.m.).